UPDATED: Burger King has been scheduled for tonights Planning Board Meeting. The agenda, which was emailed by the Township at 1:27 a.m., the day of meeting, lists Jersey Shore Federal Credit Union Phase II, which is the proposed site for Burger King. The meeting is scheduled for 7:00 p.m., in the Council Chambers at the Municipal Complex where the public is welcomed to attend and speak at the public portion of the application. Galloway Township may soon be getting a Burger King. The project site for the proposed Burger King is scheduled to be located on Jimmie Leeds Road and Eighth Avenue, behind the Jersey Shore Federal Credit Union. The area known as "Downtown Galloway", has a ShopRite, CVS, WaWa and TD bank located at the same intersection as well as other named commercial developments. The application that was submitted calls for final site plan approval for Phase II which will allow for the construction of a one-story, 2,800 square foot restaurant building called (Burger King). 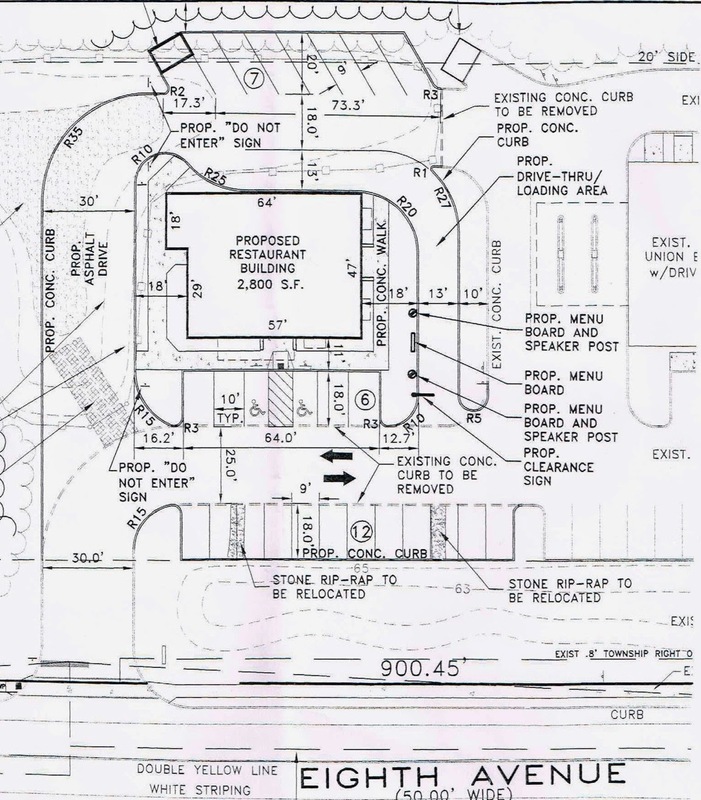 The plan calls for twenty-five (25) parking spaces and a drive-thru lane with an exit across from the ShopRite exit onto Eighth Avenue. "There has been a lot of talk about the Burger King but as of today I have not seen a plan or plans with layouts of building the Burger King or future buildings" said Mayor Don Purdy. However it appears according to the Mayor's statement he was able to secure and endorse a business in a location of Downtown Galloway without first reviewing or seeing any plans for the site location or even reviewing same for the Planning, of which he is a member of. "All of the planning that comes in front of the planning board I believe should be smart development growth for Galloway Township and I'm sure that the Galloway Township planning board has the best interest of Galloway in mind" Purdy stated. The application wasn't filed with the Township until December 2013, after the announcement by the Mayor. The application has yet to reach the Planning Board for approval. The applicant has waived the timeframe required by law in order for the Board to make a decision as the applicant is currently seeking other agency approvals and may have to submit revised plans accordingly. "Galloway Township needs more commercial development to try to offset the tax burden on the taxpayers in Galloway Township and I will reserve the right to comment until I have reviewed the plans and give my opinion on this project" Purdy stated. The application has not been scheduled for a Planning Board meeting. Galloway Township News will continue to update the status of this project. Couldn't have picked a worst spot to put this. Why can't it placed on the White Horse Pike (Route 30) next to the CVS in Pomona? This town keeps talking about the need for commercial development along that road but they keep approving commercial businesses elsewhere. Honestly...I would like to see the vacant commercial buildings in the area filled before we start trying for new construction. The coffee shop @ Jimmie Leeds & Chris Gaupp........Louie's has been vacant for years.....the diner on Pomona Rd & Route 30...the beauty parlor in the strip mall on Route 30 near the Valero gas station. I'm no expert in how to court & secure new commercial businesses....so I'll make suggestions instead of criticisms...but i would much rather see a locally owned, independent diner re-open than a new fast food joint be built. We all want to see more tax ratables & responsible growth in Galloway...I'm just not sure that a Burger King is the answer. I agree with the poster above. It's already too congested in that area. It would be great located on the White Horse Pike. The Burger King in Absecon is on a major highway and it is struggling, what makes anyone think a hidden business would strive with this proposed location? Why is they mayor wanting a Burger King in downtown Galloway? Put it on rt30 next to his business. I bet you he wouldn't want it there. Can't wait to see the traffic study that will be presented to the Planning Board with this application. The Mayor used this announcement less than one week before election day to boost his popularity. Let's see if it actually happens. "Development" like this....if that is what you want to call it....should be reserved for the Whitehorse Pike corridor of the township that is in desperate need of new projects. The fact that a BK sits on the eastern end of the Absecon WHP stretch likely deems it not an option due to franchise region exclusivity, etc. Not only is this a bad decision for Galloway to make on many levels it's simply a poor location for a Burger King Restaurant. The last scenario Galloway needs is a closed up BK in less than 5 years. It's not a sustainable location to obtain the volume of customers to thrive and succeed. This should be fought tooth & nail by the residents of the township. A few years ago Ventnor approved new commercial construction for a Checkers fast food restaurant in the Ventnor Plaza on Wellington Ave. It lasted 2 years. Good intentions...poor planning. Mayor Purdy endorsed closing the US Post Office on Jimmy Leeds Rd. because he didn't think we should be competing with private business like UPS. His words " we should not be in the postal business". I guess we ARE in the hamburger business and the other food outlets across the street be dammed because we need the tax rateables. It belongs on rt. 30, no brainer. it was also said that shoprite at jim leeds and pitney road wouldn't make it either but besies the parking, shoprite seems to be thriving. there is enough housing in that area for BK to make it. Tell sometimes when your get that craving for a cheeseburger and you have to run to Absecon, wouldn't you rather just run down the street to 8th ave then to Absecon. I know I would. It takes healthy citizens to build and sustain a healthy community. Another fast food restaurant! Really!!!??? You people complain about everything. Unbelievable. A bunch of stupid self serving comments. You need more businesses to bring down the taxes. Over 12% unemployment. This brings jobs. This is going to cause a LOT of traffic on 8th ave trying to get back on jimmie leeds rd, plus all the cars coming out of shoprite. This should have been on rt 30. Its hard enough now trying to get on jimmie leeds now from 8th ave, and forget about making a left from 8th. STUPID. Do you really thing a burger king is going to bring your taxes down? REALLY? With all the jobs lost in AC and all the forclosures and you think your taxes are going to go down or halt? NEVER going to happen. The schools keep asking for more money every year and the state saying no, a burger king is not going to help. Galloway has high taxes and we get nothing for it. Leaf pick up and sometimes snow plowing. Galloway makes it hard for a bussiness to get permits to build also dont help.